In the music theory of Western culture, a minor third is a musical interval that encompasses three half steps, or semitones. Staff notation represents the minor third as encompassing three staff positions (see: interval number). The minor third is one of two commonly occurring thirds. It is called minor because it is the smaller of the two: the major third spans an additional semitone. For example, the interval from A to C is a minor third, as the note C lies three semitones above A, and (coincidentally) there are three staff positions from A to C. Diminished and augmented thirds span the same number of staff positions, but consist of a different number of semitones (two and five). The minor third is a skip melodically. Minor third Play (help·info) equal tempered or just (help·info) (6:5). 19th harmonic (19:16), E19♭ Play (help·info). Notable examples of ascending minor thirds include the opening two notes of "Greensleeves" and of "Light My Fire". The minor third may be derived from the harmonic series as the interval between the fifth and sixth harmonics, or from the 19th harmonic. The minor scale is so named because of the presence of this interval between its tonic and mediant (1st and 3rd) scale degrees. Minor chords too take their name from the presence of this interval built on the chord's root (provided that the interval of a perfect fifth from the root is also present or implied). A minor third, in just intonation, corresponds to a pitch ratio of 6:5 ( play (help·info)) or 315.64 cents. In an equal tempered tuning, a minor third is equal to three semitones, a ratio of 21/4:1 (about 1.189), or 300 cents, 15.64 cents narrower than the 6:5 ratio. In other meantone tunings it is wider, and in 19 equal temperament it is very nearly the 6:5 ratio of just intonation; in more complex schismatic temperaments, such as 53 equal temperament, the "minor third" is often significantly flat (being close to Pythagorean tuning ( play (help·info))), although the "augmented second" produced by such scales is often within ten cents of a pure 6:5 ratio. If a minor third is tuned in accordance with the fundamental of the overtone series, the result is a ratio of 19:16, this produces an interval of 297.51 cents. The 12-TET minor third (300 cents) more closely approximates the 19-limit (Limit (music)) minor third 16:19 Play (help·info) (297.51 cents, the nineteenth harmonic) with only 2.49 cents error. M. Ergo mistakenly claimed that the nineteenth harmonic was the highest ever written, for the bass-trumpet in Richard Wagner's WWV 86 Der Ring des Nibelungen (1848 to 1874), when Robert Schumann's Op. 86 Konzertstück for 4 Horns and Orchestra (1849) features the twentieth harmonic (octave of the fifth harmonic, or major third) in the first horn part three times. Other pitch ratios are given related names, the septimal minor third with ratio 7:6 and the tridecimal minor third with ratio 13:11 in particular. 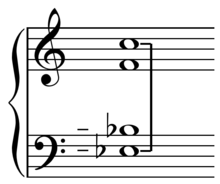 The minor third is classed as an imperfect consonance and is considered one of the most consonant intervals after the unison, octave, perfect fifth, and perfect fourth. The sopranino saxophone and E♭ clarinet sound in the concert pitch ( C ) a minor third higher than the written pitch; therefore, to get the sounding pitch one must transpose the written pitch up a minor third. Instruments in A – most commonly the A clarinet, sound a minor third lower than the written pitch. Semiditone as two octaves minus three justly tuned fifths. In music theory, a semiditone (or Pythagorean minor third) is the interval 32:27 (approximately 294.13 cents). It is the minor third in Pythagorean tuning. The 32:27 Pythagorean minor third arises in the C major scale between D and F.
It can be thought of as two octaves minus three justly tuned fifths. It is narrower than a justly tuned minor third by a syntonic comma. ^ Haluska, Jan (2003). The Mathematical Theory of Tone Systems, p.xxiv. ISBN 0-8247-4714-3. 19th harmonic, overtone minor tone. ^ Curtis ME, Bharucha JJ (June 2010). "The minor third communicates sadness in speech, mirroring its use in music". Emotion. 10 (3): 335–48. doi:10.1037/a0017928. PMID 20515223. ^ Dowsett, Peter (2015). Audio Production Tips: Getting the Sound Right at the Source, p.3.6.3. CRC. ISBN 9781317614203. "The minor third, however, does not appear in the harmonic series until the nineteenth harmmonic. Your ear almost expects to hear the major third ([on A:] C♯), and when that is replaced with a more distantly related note, this makes the listener feel more 'unpleasant', 'tense', or 'sad'." ^ Alexander J. Ellis (translating Hermann Helmholtz): On the Sensations of Tone as a Physiological Basis for the Theory of Music, page 455. Dover Publications, Inc., New York, 1954. "16:19...The 19th harmonic, ex. 297.513 [cents]". Later reprintings: ISBN 1-150-36602-8 or ISBN 1-143-49451-2. ^ Prout, Ebenezer (December 1, 1908). "In the Forecourts of Instrumentation", The Monthly Musical Record. p.268. ^ John Fonville. "Ben Johnston's Extended Just Intonation- A Guide for Interpreters", p.124, Perspectives of New Music, Vol. 29, No. 2 (Summer, 1991), pp. 106-137.